One Size. Priced per pair. Cushions and protects back of heel. Self adhesive: Stays firmly in place. 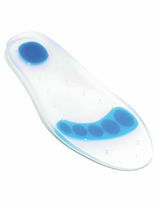 Clear massaging gel cushions are thin and discreet. Washable and reusable. Fits in all shoes. Ultra Thin - One Size - Per pair. Cushions and protects heels: relieves heel pain. Shock absorbing pattern. 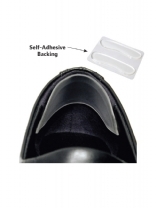 Self adhesive backing on heel. Anatomically designed heel spur cavity which is used to treat heel pain, heel spurs, plantar fasciitis and knee & back pain. One size - up to women's size UK7. 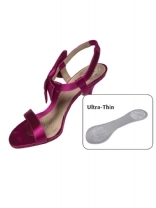 Adds a layer of cushion and improve comfort of sandals and open toe footwear. Low profile design, washable and reusable. 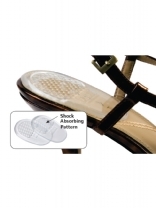 Patented non-slip, transparent gels absorbs shock, shear and friction forces along the entire bottom of the foot. Priced per pair. Use – corrective product for relieving heel pain & improving stability while redistributing pressure away from common stress points. Priced per pair. Dual-durometer construction for extra protection of rear and midfoot tissues without crowding the shoe. 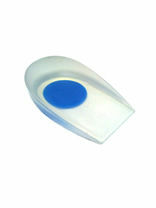 Anti-microbial cover absorbs odour, prevents bacterial growth and allows foot and insert to slide easily into the shoe.